Over time, nurses develop a nursing intuition and a working knowledge of disease and trauma. Our intuition, knowledge, and caring don’t automatically shut off when we leave work. For example, have you ever seen a worrisome mole on a complete stranger? Have you felt concern about a friend’s weight or a neighbor’s smoking habits? Have you ever been in a public place when you heard someone coughing—and wondered at what point you might intervene? These experiences are common among nurses. Yet, inability to shut off our knowledge and caring may leave us feeling emotionally saturated and raise our risk for compassion fatigue. Compassion fatigue can happen to any nurse—and it can be unpredictable. We know that nurses who work in oncology or see more patient deaths may be at greater risk. Also, when we form close, caring relationships with patients (especially if we lose our personal boundaries), we may be putting ourselves at higher risk. Sometimes a particular patient or a patient’s family member may remind us of someone important in our lives. If that patient or family member has died, we may be triggered emotionally. Many nurses I interviewed in my research described being triggered unexpectedly and profoundly by a smell (caring for a child with second- and third-degree burns over 50% of his body), a sound (a mother screaming with grief when told her 3-year-old child had coded and died), or a sight (a dog on the hospital bed with his head across his master’s chest). Nurses who skip breaks, take extra shifts, or come in on their days off out of a sense of duty may be more at risk for compassion fatigue. One of the greatest risks for compassion fatigue comes when nurses forgo their own self-care. What does compassion fatigue feel like? In many cases, the first symptoms are emotional. Nurses talk about feeling bored with their work or feeling detached and distant from patients and colleagues. They may realize they’re irritable and short-tempered. They may feel they’ve failed to relieve a patient’s pain or to help a patient get well, losing their sense of pride in being a nurse. Frequently, nurses with compassion fatigue talk about sleepless nights as they worry about what they forgot to do at work or replay disturbing events in their minds. They may be forgetful at work, in school, or at home. As compassion fatigue progresses, physical symptoms typically arise. Most nurses describe feeling physically and mentally exhausted, and many report headaches or backaches. Frequently, I hear nurses say they feel queasy just driving to work, and those feelings intensify as they walk in the door. What happens to nurses who don’t deal with compassion fatigue symptoms? First, their work performance changes; for example, they may be at risk for medication errors. Without realizing why, they may start to call in sick more frequently. They may be short-tempered, sarcastic, or rude to colleagues and even to patients or families. They may appear tired and may become more easily startled. Unfortunately, they may attempt to reduce their emotional saturation through alcohol or drug use. Ultimately, when emotional saturation becomes too intense, some nurses may view leaving the profession as the only means of escape. Can you have compassion fatigue but still feel compassion? Absolutely. 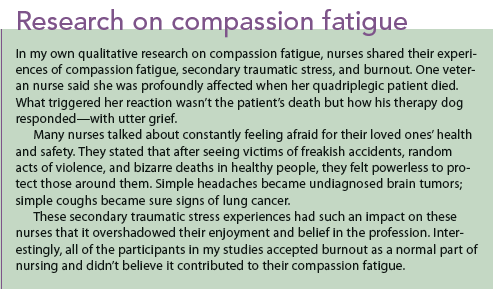 In my studies, some nurses volunteered that they felt symptoms of compassion fatigue, yet stated, “But I also still feel compassion.” Clearly, a nurse can have symptoms of compassion fatigue while still feeling compassion. If anything, the more compassion a nurse feels, the greater the risk that she or he will experience emotional saturation or compassion fatigue. What can you do to reduce or even prevent compassion fatigue? Start by being aware of how you feel physically and emotionally. If you realize, for example, that interactions with a specific colleague often feel uncomfortable or unpleasant, reflect on that a bit. Explore what’s beneath that feeling. Perhaps you feel overlooked, ignored, invalidated, unfairly treated, or criticized—but instead of accepting those feelings and trying to make a change, you compound your feelings with guilt and shame. When you experience negative emotions, pay attention to how you feel physically. By bringing physical and emotional feelings to the surface, you can more efficiently address the underlying cause. Establishing healthy boundaries is an important way to reduce the risk of compassion fatigue. Many of us face minor boundary issues frequently without really considering the consequences. Examples might include answering a question you feel uncomfortable with, sharing personal information you’d prefer to keep private, doing a favor for someone not because you want to but because you feel you have to, having someone hug or touch you in a way that makes you uncomfortable, and tolerating a rude or pushy person. By slowing your response and doing some self-reflection, you can address these issues with firm but courteous responses. Make self-care and self-compassion priorities. Perhaps the most important way to prevent or reduce compassion fatigue is to take care of yourself. As nurses, we work hard and really need our breaks. We need to eat, and to take time for ourselves without being interrupted by alarms, patients, or colleagues. We also need our time off, for our mental and physical well-being. Before you were a nursing student and nurse, you probably had hobbies or activities you enjoyed. But later, between working long hours and trying to balance your personal and professional lives, those hobbies and activities were probably the first things you let go of. So try to bring them back into your life. Take the dog for a walk every day, listen to music, read a book for pleasure, go for a hike, call a friend—do something for yourself every day. Self-compassion is important, but it may be hard to attain. Start noticing how you talk to yourself when frustrated, upset, or angry. Do you berate or criticize yourself? Try replacing that talk with kindness, just as you might talk to a loved one. Parts of your job may make you feel frustrated because you feel powerless. As burnout and compassion fatigue build, your emotions may grow so strong that they become an overwhelming blur of anger, resentment, frustration, or helplessness. Thoughtful and quiet self-reflection away from work may help you slowly separate events, interactions, and experiences. By examining each event or interaction, you can become more aware of your triggers (specific people, situations, or events) and address each one individually. Even if you can’t change your work environment, you can find power within by listening to your emotions with kindness and approaching colleagues and others from a wise and centered perspective. Mindfulness is an important part of self-compassion. Although mindfulness has its roots in Buddhist meditation, it’s also a secular cognitive practice in the form of mindfulness-based stress reduction. To practice mindfulness, take note of the present and pay attention with kindness and curiosity. You may notice physical or mental feelings of pain, fatigue, or pleasure. If you feel pain, ask yourself what your body or mind is trying to tell you—and address those concerns. By engaging in mindfulness, you can learn to identify which areas of your body react to your emotions. Mindfulness can reduce stress and anxiety and improve your physical and mental well-being. Through self-reflection and mindfulness, you allow yourself to consider events and triggers, learn from them, forgive yourself, and move forward. We can all reduce our risk of compassion fatigue and emotional saturation by reflecting on our triggers, practicing mindfulness, replacing self-criticism with kind self-talk, and engaging in daily self-care activities. Finally, if you’re suffering from sleeplessness, poor self-care, loss of interest, or other symptoms of distress, reach out for help from an employee assistance program or a mental health provider. Kate Sheppard is a clinical associate professor and the psychiatric–mental health nurse practitioner specialty coordinator at the University of Arizona College of Nursing in Tucson. Maiden J, Georges JM, Connelly CD. Moral distress, compassion fatigue, and perceptions about medication errors in certified critical care nurses. Dimens Crit Care Nurs. 2011;30(6):339-45. Neville K, Cole DA. The relationships among health promotion behaviors, compassion fatigue, burnout, and compassion satisfaction in nurses practicing in a community medical center. J Nurs Adm. 2013;43(6):348-54. Sheppard K. Compassion fatigue among registered nurses: connecting theory and research. Appl Nurs Res. 2015;28(1):57-9.